NERO SPEAKS: ‘This Guy’ texts my wife again! Okay so it's nothing major, but it's a slow news day and I thought I'd share. 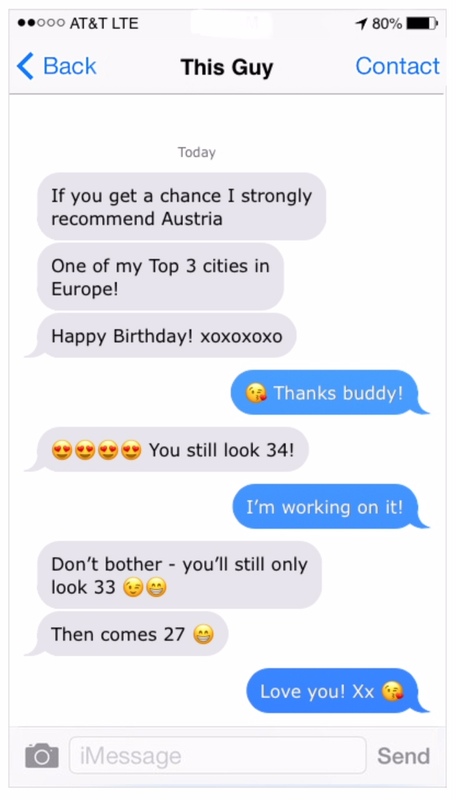 I created the above from a fake text message generator, but they're actually Facebook Messenger messages. 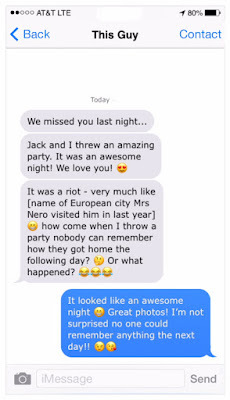 These messages to my wife started while we were on vacation in Europe last month. Why am I sharing? Whether anything more happened I don't know but after that 'wild night in Tijuana' they seem to have bonded strongly and some of their messages to each other (he lives in another country) I've always considered to be more intimate than need to be. She doesn't send those emojis to the other guys in BNG (okay, maybe the odd wink or smiley face) - and she doesn't send them to me either. So what's going on? Nothing really, I suppose. 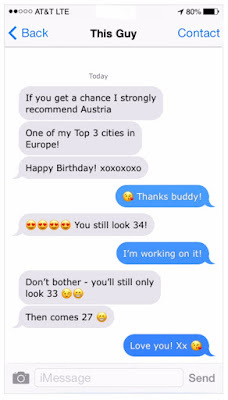 He's just a bit flirty with his birthday wishes, flattering her by knocking almost 20 years off her age, and then saying she couldn't possibly look any younger than she does now. I think he's about 34, but (and here's the rub) he only looks 27. So one could presume he's joking about them being closer in age to each other - is that because something happened (or almost happened) between them but she told him later that it couldn't happen again because he was way too young for her? That didn't stop her from visiting him last year in Europe, taking a side trip (and 3 hour flight) to his city from the BNG conference she was attending. She said he 'showed her the sights' but that it was pretty boring and she didn't rate the city much. 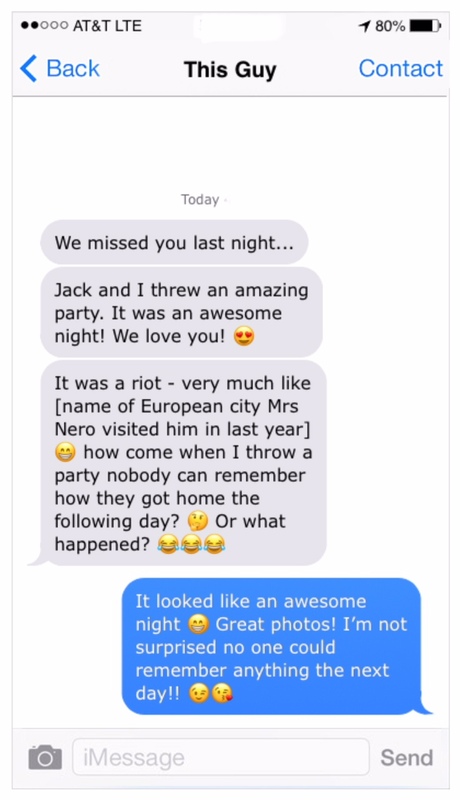 Judging by these messages she neglected to mention the big party he threw in her honor when she arrived? PS - And before anyone suggests it, no he's not gay. Jack is not his partner.